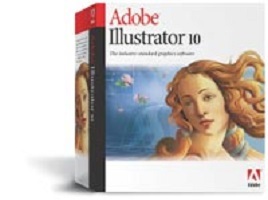 Adobe® Illustrator® is a powerful vector illustration tool that has competed with Macromedia’s Freehand for years. While I believe Illustrator easily tops Freehand in most areas, it has had growing pains along the way, sometimes giving designers a product that was either buggy or so demanding that it slowed workflow considerably. Though there are a few glitches to be aware of in version /files/includes/10.css, Adobe has added several new tools and features that make it a very worthwhile upgrade. What would an upgrade for an illustration application be without new drawing tools? Thankfully, these come in the form of four new tools that greatly simplify common tasks. The Line Segment tool allows the user to add straight line segments with a simple click or a drag—much more cleanly than having to do it point-by-point. The Arc tool follows the same model, creating arcs by dragging or clicking, with an options palette for more precise control. The Rectangular and Polar Grid tools offer interesting new design possibilities; but even better, you can convert them to guides for use in your work. A nice addition, but I wish that Adobe would consider adding 3D perspective grids like those in Freehand. The Magic Wand selection tool makes selecting multiple objects a breeze. When files start getting large and confusing with a myriad of objects and layers, this is the tool to use to quickly select multiple objects with similar attributes. You can narrow your selection by any combination of fill color, stroke color, stroke weight, opacity range and blending mode in the tool’s option palette. This is dramatically better than having to use the direct selection tool or even the Magic Wand. One area where Illustrator deferred to Freehand in previous versions was distortion envelopes. Illustrator /files/includes/10.css adds them, and they are much easier to use and much more powerful. You can use any path or object to distort another object simply by selecting “Make with Top Object” on the envelope distort menu. You can also make an envelope with a warp, which mirrors the warp text options in Photoshop 6. These warp settings are a great way to quickly distort objects, but don’t offer as much detailed control as I’d like (such as offered in the vector distort module in the Vector Effects plug-in). Hopefully Adobe will build on this feature in future versions. If you like playing with the gradient mesh tool, you’ll love the “Make with Mesh” option in the envelope menu. This supplies an editable grid that gives a quite organic feel to object manipulation. Adobe has also enhanced general shape manipulation with the Reshape tool. This distorts the object or path in a more intelligent and natural way, and takes away the headache of having to figure out which points to select to make a simple shape change. While this is a great tool, I’d like for Adobe to reform their Free Transform tool and Free Distort filter into a single tool that allows users to distort objects within a rhomboid (as in Photoshop’s Free Transform option). It’d go great next to the shear tool on the toolbox. For more in-depth distortion to your objects and paths, the toolbar sports seven new warp tools. The /files/includes/default.css warp tool is quite useful, allowing the user to nudge a path around in a natural manner. The other six tools: Twirl, Pucker, Bloat, Scallop, Crystallize, and Wrinkle liquify your images and are fairly self-explanatory. They all work quickly and make for some interesting results. Warp effects can be quite useful for making vector art appear more natural, but users should be careful not to go overboard. New and touted but ultimately cheesy, the new Lens Flare tool brings another overused effect into Illustrator. I’m not sure why they thought this was important enough to place on the toolbar. Perhaps we’ll see pagecurls in an upcoming release. That said, the effect is rather realistic, and should prove useful when someone forces you to include this effect in your design. Pathfinder operations have been enhanced for increased editability and better compatibility with Photoshop 6’s shapes layers handling. Operations like Combine and Subtract now work more like in Photoshop, combining selected elements but still preserving each element’s editability. Clicking on the Pathfinder palette’s Expand button converts these grouped elements into a single shape. This is a smart new addition that will save a lot of backtracking. The most revolutionary aspect of Illustrator /files/includes/10.css is the introduction of its Graphic Symbols tools. These tools reduce file size and benefit manageability in much the same way that symbols are used in Flash. Beyond that, the tools make image repetition much easier and cut down the number of steps that are needed to do the same thing manually. Any object or group can be quickly turned into a symbol, and accessing it for reuse is as simple as selecting your symbol in the Symbols palette. Updating a symbol automatically updates every instance of that symbol in your document. Eight new symbol tools on the toolbar help you manage and create quickly and easily. The Symbol Sprayer tool works very similarly to the Graphic Hose in Painter, quickly applying several instances on your artboard. Attributes such as size and angle can even be controlled by a pressure-sensitive tablet. My only gripe is that this tool is a bit slow, but perhaps it’s just my meager 400 mhz processor. Once applied to the artboard, the other symbol tools can be used to modify the instances. Quickly change the rotation, distribution, size and position of each of a group of instances—the tools are impressively intuitive. The Symbol Stainer tool applies a raster-like colorizing effect to your symbols, and the Screener tool applies eraser-like transparency effects that would make you swear you were working in Photoshop. Plus, you can use the Symbol Styler tool to apply preset or user-created styles in varying amounts to your symbols! Of course you have the option to break the link between placed symbol instances and the original if you wish to modify the objects without making a global change, but this means you lose the benefit of smaller file sizes or being able to make global symbol changes. The applications for these tools are wide and varied. Not only do they make for efficient and small files, but they also open up new creative possibilities. Illustrator /files/includes/10.css also packs quite a few new, web-centric features that designers will appreciate. While some of these features are in place to push the use of other web-related Adobe products, there are plenty of things here that anyone will enjoy. Similar to the convention used in Photoshop/ImageReady and Fireworks, Illustrator now offers native slicing, which can be manual, guide or object-based. Slice attributes such as slice names, URLs and targets can be set directly in the application. HTML files can be generated directly from Illustrator, and Illustrator text can be output as HTML text. The Save to Web option lets you specify compression schemes for each slice, as well as specify whether the HTML output will be standard or CSS output! This is a very impressive capability for a vector illustration program. Unfortunately, you can’t create rollovers within version /files/includes/10.css, so if you need them you’ll still have to use LiveMotion or Photoshop to generate them. Version /files/includes/10.css features enhanced support for the Flash format, providing the ability to export documents as Flash files. This is great for generating quick animations directly from Illustrator and preparing files to use within Flash. One unfortunate fact of upgrading is the loss of third party plug-ins that many have come to rely upon. Illustrator /files/includes/10.css’s plug-in architecture has been rewritten, therefore voiding older plug-ins’ compatibility and sending outside developers back to the drawing board. Apparently, Adobe gave fair warning some time ago, so it’s disappointing that third party developers are mostly still either playing catch-up or playing dead. Vertigo Software promises a forthcoming update to their 3D Words plug-in sometime soon, which is a decent but fairly limited way to create warped 3D text within Illustrator. Hopefully the compatibility upgrade will be joined by more precise control. In any case, it’s good to see that they are working to put this tool back in our hands. For more information, check out their website. More people are probably familiar with KPT Vector Effects, a product acquired by Corel some time ago. According to the representative I spoke with, Corel has no plans to make Vector Effects compatible with the current version of Illustrator, and no plans for the product’s future. It would be nice to see Adobe acquire it and integrate the better features into the native toolset, such as the 3D transform and vector distort effects. Contact Corel and let them know how you feel about their inaction. While searching around for plugins that will work with Illustrator /files/includes/10.css, I came across one that I wish I had before, Cvalley’s “FILTERiT.” Version 4.1 is compatible with Illustrator /files/includes/10.css on Mac OS 9.1 and above, OSX, and Windows XP. FILTERiT is a plug-in suite full of amazing effects and time-saving tools that anyone who uses Illustrator on a regular basis needs to have. Simply put, this plugin basically blows away KPT Vector Effects or any other plug-in I have seen for Illustrator. There are so many things here that I have been wishing I could do with Illustrator, and many more things I couldn’t have imagined. And these are not just flashy tricks. Most of them are completely appropriate and applicable for everyday use. This suite of 13 live effects, two filters, and seven tools automate what many designers have had to do by hand for years. For example, the Live Circle effect automatically distributes several copies of a selected object around a circle. Live tiling automatically creates several rows and columns of an object, updating dynamically as you tweak parameters. Live Galaxy and Explosion create unique graphic effects that would be difficult if not impossible to recreate manually. You can achieve impressive intricacy in just a few short steps, and the best part about it is that live effects don’t lose their parameter editability until you expand or release the effect. On the main Illustrator toolbar, FILTERiT provides Lens, Warping, Broom, Roughening and Crafting options to shape and manipulate your objects even more. An interesting feature on these tools is the Trace option, which creates blend-like numbered steps between warped states. Releasing this effect to layers allows one to export the transformation as a Flash animation. The Metabrush tool turns a selected path or object into a brush that acts somewhat like the symbol sprayer, with numerous parameters to control dispersion. The trail tool simulates motion blur with an opaque to transparent fade. The 3D transform filter is great to have, and is quite easy to use to rotate your artwork on x, y and z axes. While there is an option to introduce perspective, there is sadly no depth or extrusion offered. For now one must go outside Illustrator for 3D vector art creation. If FILTERiT integrates extrusion, I’ll gladly forget about Vector Effects. One minor drawback is that you can’t apply any of FILTERiT’s effects or tools to a symbol instance without first breaking the symbol’s link. It would be nice if CValley would look into adding this capability soon so designers can capitalize on the power of symbols combined with these amazing effects. For just $129, FILTERiT pays for itself very quickly in increased productivity and creative inspiration. I was ecstatic to finally have quick access to the advanced Reflection and Radial distribution tools—and astounded at what else is offered here. You can find out more about this plugin and download a tryout version at their website. In the short time I’ve been using Illustrator /files/includes/10.css, my problems have been minor and few. I get a pesky error message every time I quit out of the program—telling me that Illustrator crashed because of a memory problem. It doesn’t affect my work, but leaves a nagging worry that something bad might be happening behind the scenes. Other than that, some of the tools seem to be a bit slow. Performance overall is not as quick as I’d like, especially when working with documents with very complex paths. It’s also quite perplexing that Illustrator /files/includes/10.css will choke when dealing with autotraced paths created within the program, but behaves just fine when dealing with files imported from Adobe Streamline. It’s about time for Adobe to go ahead and integrate the more complex capabilities of Streamline (now about 5 years old) into Illustrator. As for other bugs, I have read that some users have had speed issues with some system configurations, and others have had /files/includes/print.cssing problems because of incompatible drivers. If you do a lot of /files/includes/print.css work, you may need to investigate further. Illustrator /files/includes/10.css’s new tools and features make upgrading an easy decision. The addition of the symbols toolset alone will revolutionize creativity and workflow for both /files/includes/print.css and web designers. Web designers will appreciate the powerful HTML, Flash and database graphics options. You may want to keep a close eye on Adobe’s online user forums for technical/production issues and bug reports to help evaluate the switch. Aside from the minor bugs I’ve encountered, I am excited to be working quicker and better with the array of new useful tools and features in Illustrator /files/includes/10.css.